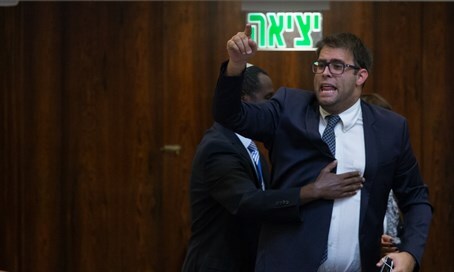 Oren Hazan warns that he will quit coalition unless his punishment is lifted. This would leave government without a majority in the Knesset. MK Oren Hazan (Likud) met with Prime Minister Binyamin Netanyahu last night (Monday), to warn that he would leave the coalition unless his punishment is lifted, Channel 10 reports. This would leave the coalition without a majority in the Knesset and could quickly lead to the government collapsing. Hazan was suspended from the Foreign Affairs and Defense Committee for missing Assembly votes. Coalition head MK Tzachi Hanegbi (Likud) claimed that his absences caused a number of bills to fail. In response, Hazan withdrew his membership from all other committees. Hazan says that he will present Netanyahu with a list of other Likud MKs who missed Assembly votes without finding someone to fill their place and thereby caused the defeat of coalition bills. He says that this list will include Deputy Foreign Minister Tzipi Hotovely, Science Minister Ophir Akunis, and Tzachi Hanegbi himself. Knesset members are elected as part of a party list. Once they are sworn in, though, the seats belong to the individuals and any member is permitted to change party affiliations. Should his threat come to pass, Hazan claims that he would serve as an independent MK.